How to Solve the ‘550- Unrouteable Address’ Error? The reasons for the 550 email errors range from a non-existing email account to a wrongly added email server rule. To rectify the error, first, we have to analyze the basic process behind every email communication. While sending an email, it is routed from the server email to the receiver email server. Later the recipient downloads the email from his email server. So the error happens during this email delivery process which is either driven by the sender or by the receiver. 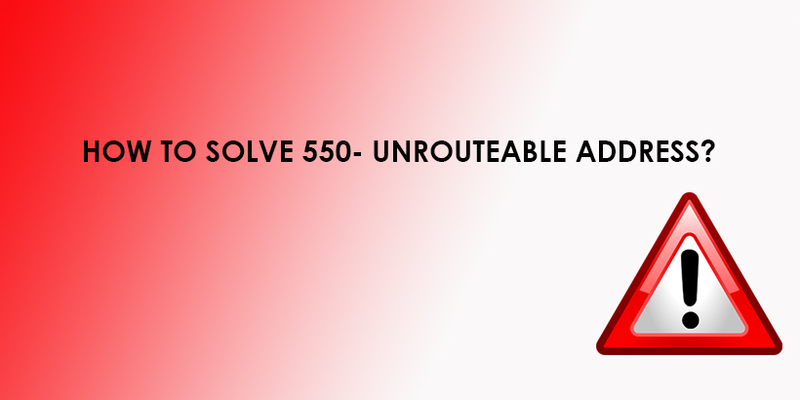 In this blog, we will discuss the error ‘550-Unrouteable address’ and its solution. While sending an email via Outlook or webmail, in the bounce message, the error message ‘550-Unrouteable address’ is displayed. We can track the source of the error from the complete bounce message. Understanding the causes for the error, help us to make the right resolution for the error. When the email is delivered to a non-existing recipient domain, it shows a ‘550-Unrouteable address’ error. Another reason for the error is when the user sends an email with a wrong typo in the email address. In such cases, the email reaches an invalid email address. Configuration errors in email server also cause errors, you can choose any remote server management company like Ideamine to keep your server error-free. While sending emails to a deleted, deactivated, and expired email domain also causes ‘550-Unrouteable address’ error. So if the recipient email addresses are wrong, the emails would not be delivered and would bounce back to the sender by giving an error message. Ensure the domain is resolving fine by verifying the DNS resolution results. The sender email server will not be able to route correctly to the recipient email server unless the MX records are set properly for the recipient domain. If there is any error in the DNS settings for the recipient domain, the other external emails servers render the email delivery as unreachable. The temporary DNS resolution issues with the sender’s ISP make it difficult to resolve the domain of recipient correctly which lead to the failure of email routing. So it gives rise to the bouncing back of emails and thereby the ‘550-Unrouteable address’ error is displayed. Contact the recipient server support, if you find any connectivity issues to remote email server or DNS errors or missing of MX records and get it fixed. Many email servers will not accept emails from the senders whose email server is in any spam blacklist. Services like Amazon SES might help you to land your emails in inbox. There are email servers which accept emails only from grey-listed senders. In RDNS security checks, it is mandatory that the server IP and its hostname have to map with each other. In order to route the IP address to the sender server name, a PTR record is set. If the sending address PTR record is not matching with the receiving address, some servers will reject the email. If the recipient server can’t verify the sender properly, the email bounces back and thus displays the error. Through checking the spam blacklist and confirming with the remote email server, the rejections or blacklisting from the recipient email server can be confirmed. In order to secure the server in case of the blacklisting, scan the server and remove all spamming scripts and implement security measures. Check whether all the email scripts are configured with the valid sender and recipient email addresses. Thus, we can avoid sending emails to invalid addresses. In email server such as Exim, the number of emails a domain can send out every hour has a limit. After the limit exceeds, the emails would bounce back to the sender by displaying the error ‘550-Unrouteable address’. The wrong routing of the domain can also cause the display of the ‘550- Unrouteable address’. The firewalls and other security rules in recipient email server too become a reason for the error. These scenarios are capable of generating the error ‘550- Unrouteable address’. In creating the error ‘550- Unrouteable address’, the sender and the recipient email server address has a vital role. In fixing the error, the first step is to verify whether the email addresses are correct or not. It should be the foremost goal because most of the ‘550-Unrouteable address’ happen due to the wrong email address both in sender and receiver sides. Setting the MX records correctly helps the administrators to rectify the error. Now, most of the email servers maintain strict security measures. So meeting the security or quality standards not only protect your email servers but also help you to communicate with other servers. It eliminates the chances of displaying the error. You can always opt for any server management company to keep your server error free. In brief, the fixing of the error ‘550- Unrouteable address’ is solely under the control of the server users. Following the required standards and procedures makes the server free from hazards of email communication which is highly important in meeting the enterprise requirements. Tell us what your business is about and what your needs are. Let our expertise flow into your business and transform it! Ideaminetech is the preferred IT solutions partner for a number of global businesses. Our wealth of experience in comprehensive IT services is what you need to get your business running like clockwork.